Residents from New Orleans’ lower 9th ward joined executive directors, CEOs, clean-tech advocates, green collar workers and trainees, community leaders, and politicians straight from city hall teamed with Global Green USA at the site of the Holy Cross Project recently to install solar-PV systems on the rooftops of the 2nd and 3rd single family homes currently underway. Even Congressman Anh “Joseph” Cao, who recently filed a request for $500,000 to fund all of the project’s renewable energy systems, showed up later in the day to tour the first model home which has been completed and open for tours since May 2008. The day was both a celebration of the expansion of the Holy Cross Project, which has tripled in size during the past year with three houses now on the lot, and a chance for green building and renewable energy enthusiasts to check out a solar panel installation. It was also a chance for a trainee from a local solar installation course to participate in his first actual installation as part of his PV-certification process. 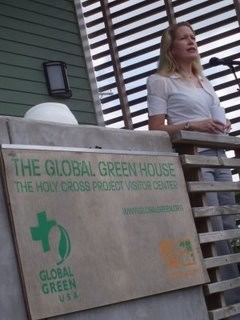 What the New Orleans community needs are not only green and sustainable buildings and houses like the model house here at the Holy Cross Project, but contractors that have been trained to build this way, using the green methods and practices we’ve used and are using to build these structures,” said Mike Lopez, Global Green USA’s construction manager at the Holy Cross Project. “For that reason, we decided to try to hire only local, professional contractors, and train them in how to build this way, so that long after we’ve completed this and our other projects, local citizens will have access to a pool of skilled and qualified contractors who can build to sustainable, responsible standards for their own projects, both residential and commercial,” said Lopez. Although solar panels and other renewable energy options are becoming increasingly available and accessible, particularly in Louisiana, which offers buyers generous tax credits in addition to the Federal incentives, the systems are still expensive and thus remain mysterious or out of reach for much of the population. Many of us, even those of us who have made careers out of promoting, organizing, lobbying for, writing about and generally dabbling in green-geared activities and industries, have never seen an actual solar panel installation. It was super cool. South Coast Solar, the local renewable energy firm who were hired by Global Green to perform the installation, constructed a special 20-person capacity viewing platform for the event. After remarks from Global Green’s New Orleans Director Beth Galante, South Coast Solar President Troy Von Otnott, New Orleans Office of Recovery Development and Administration Belinda Little-wood and Chief of Staff for Councilperson Cynthia Willard Lewis, Clarence Bickham, attendees were invited to climb a couple of flights to watch the team do the job at eye-level. They also permitted Julio Cardoza, a trainee from a course presented by local solar installation trainers Louisiana CleanTech Network (LCTN) to participate. Real trained personnel in this industry are hard to find. You can go to an institution, you can go to school, and you can get trained and qualified for NABCEP certification without ever doing anything on the roof. Sure that’s possible. But is that going to help the industry? No. 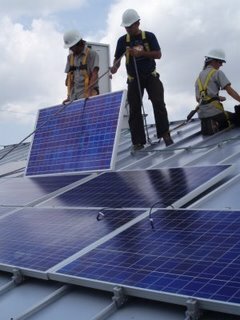 Programs like this, where you actually get the knowledge and the training in the field, that’s what we really need and what the solar industry needs,” said Aaron Garrett-Schesch, the newest member of the South Coast Solar team who moved to New Orleans just one week before the installation at Holy Cross. The South Coast Solar team, with help from Cardoza, laid down and fastened 16 panels which will yield 193 watts each – that’s 3,088 watts per house. Cardoza has passed the required NABCEP exam and is making his way through the next round of qualification which involves serving as “lead installer” on two jobs. A Nicaraguan native, Cardoza came to the U.S. five years ago to attend Alabama’s University of Mobile, and has worked in the construction industry as a plumber for the past two years. Noticing the rapid growth of the solar industry in New Orleans, he began investigating local training opportunities to get certified as a renewable energy system installer. Through his research he found Louisiana CleanTech Network, who have been offering solar electric training courses in Louisiana since 2008 and have since trained over 140 local workers. But the classroom coursework is just the beginning of the training process. LCTN courses prepare trainees with the information they need to pass the preliminary, industry standard NABCEP exam. Once passing the first test, LCTN pairs students with local, accredited companies that will permit them to practice as lead installers for a total of two installations in order to qualify for the second PV-certification exam. LCTN linked Cardoza up with South Coast Solar, who invited him to participate in Global Green’s Holy Cross Project installation. In between gulps of water and wiping sweat from his brow, Cardoza called the experience “way, way different” from being in the classroom. He declared with confidence, though admitting to have wondered previously, that he is not afraid of heights. Cardoza plans to stay in New Orleans and focus on his professional development in the solar industry. As for Nicaragua, which he said is far behind in adopting alternative energy use, Cardoza hopes to go back someday and share his solar skills and knowledge with his native country. I am planning on staying here long term, but I’m focused on doing what I have to do in terms of getting experience. [In Nicaragua] they don’t have any idea about this. They are still struggling with the old technology. Hopefully one day I’m going to go to Nicaragua and share this experience over there,” said Cardoza.